ADDED automatically mark 100% fullfilled awards. The function is selectable in the user data window, standard is on. 30MDG rule that only QSOs made under a personal call are valid. current and/or former personal call sign to exclude them in 30MDG award applications. If we can't answer to your email you will be received an info popup and you can't apply for awards until you have fixed the problem. FIXED missing awards in Window "exclude Awards"
For all 30MDG awards are SWL reports not countable. Please add #SWL to your comment field for each SWL report in your log. ADDED 30MDG club with all awards. But keep in mind you have to be a member of the 30MDG to apply. 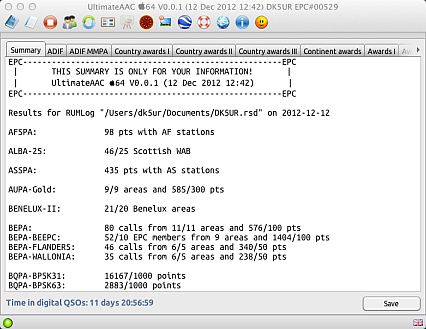 If you are registered with another call sign in the 30MDG than in the EPC. Please insert in the number page of the userdata window your 30MDG membership number (5 digits fill left with 0). Please use the update function to get new language, county and municipality files!!! CHANGED CUSPA evaluation from "CNTY" check to "#AREA" check. Please check the rules for CUSPA!!! CHANGED all canadian awards evaluation from "CNTY" check to "#AREA" check. Please check the rules for CAxxA!!! CHANGED JMPA evaluation from "CNTY" check to "#AREA" check. Please check the rules for JMPA!!! Each erroneous award application for the ITUPSK may be sanctioned by an immediate suspension. ADDED new check for zones to ITUPSK, MMPA and ITU-DMC.Check button opens a page in your favourite explorer which shows you the contacts at a world map.All QSOs with a locator will be dosplayed. A red pin indicates some problems.Please do all changes in your main log file and recheck your log, if needed.